Use your own photography to brighten the mood in a room. Some landlords are decidedly lax in their restrictions about the interior modifications you make to their place. I once had a Landlord that happily granted me permission to paint every room in the apartment, re-tile the kitchen floor, paint the cabinets and change all the hardware, generally allowing me to use it as an interiors test lab. This sadly is not the norm. Many Landlord’s fear a whole laundry list of horrors being unleashed on their unsuspecting, and defenseless dwellings and therefore forbid, that’s right, FORBID, even the tiniest of modifications. There will be repercussions. Deposits will be withheld, regrets will ensue, the backlash will come to bite you. Who wants and/or needs all that, I ask you? Well no one of course, but to do nothing is really unacceptable. Wouldn’t you agree – of course you would, it’s not your hard earned money in jeopardy. As everyone is frightfully aware, we here in Boston are inundated with snow, cold, and increasingly dark moods. I ask you all for forgiveness in advance for anything dull or distasteful I may have said during these difficult winter months. In consideration of you all, I escaped to Florida for a long weekend, and was blessed with two hours and twenty minutes on the beach basking in all 85 sunny degrees. Beggars can’t be choosers, and I took my Vitamin D where I could get it. 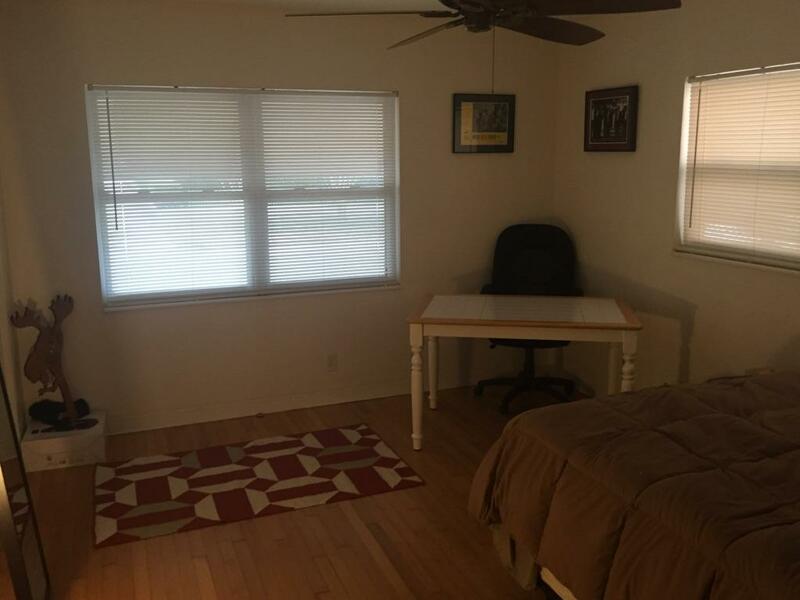 My good friend kindly put me up in his two bedroom rental property. I am sure you can hazard a guess as to which camp his Landlord falls. It seems so wrong that the very thing that can so quickly and inexpensively turn dull into dynamic is so readily denied. NO Painting. I’ve never been a big fan of a boldfaced NO, but respect the limitations. I decided to start with the guest bedroom. It’s really a bit yellow bellied of me to begin there, but I am less likely to step on his stylistic toes. After all, who puts anything they really care about in a spare room? It gives me a little more freedom, and while still in the midst of this winter – I think I’ve earned it. Here is what I would do. Rooms are dark, lacking natural sunlight, which is accentuated by the muted cream walls. Drawing my inspiration from the Cole & Sons Palm Jungle Paper, which fingers crossed, I have enough left from a previous project to paper two panels. These will be placed at the corner on both window walls. I would outfit the bed in crisp white cotton duvet and sheets, trimmed in Kelly Green. Years ago I stumbled upon a little shop in the LES (that’s the Lower East Side of NYC to you) called Hable Construction. 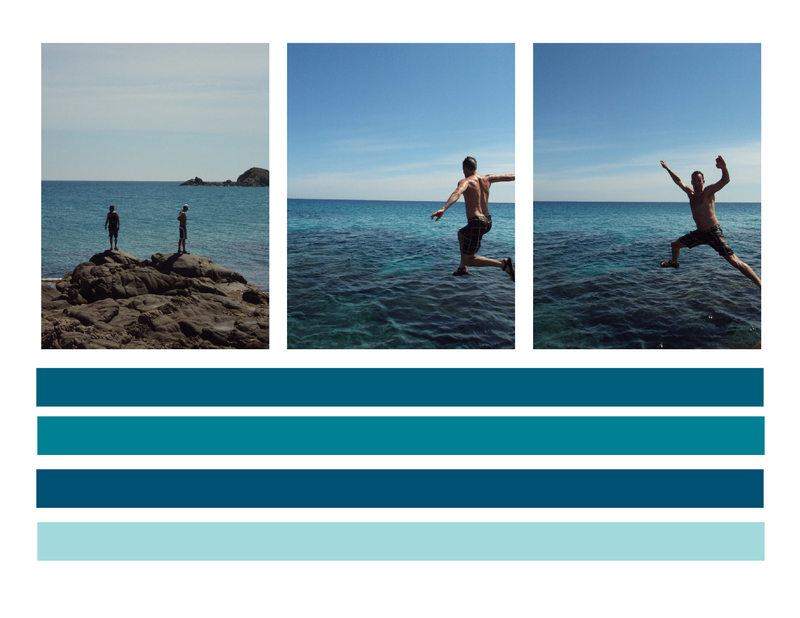 I immediately fell for their style and their nod to the ocean through their textile design. 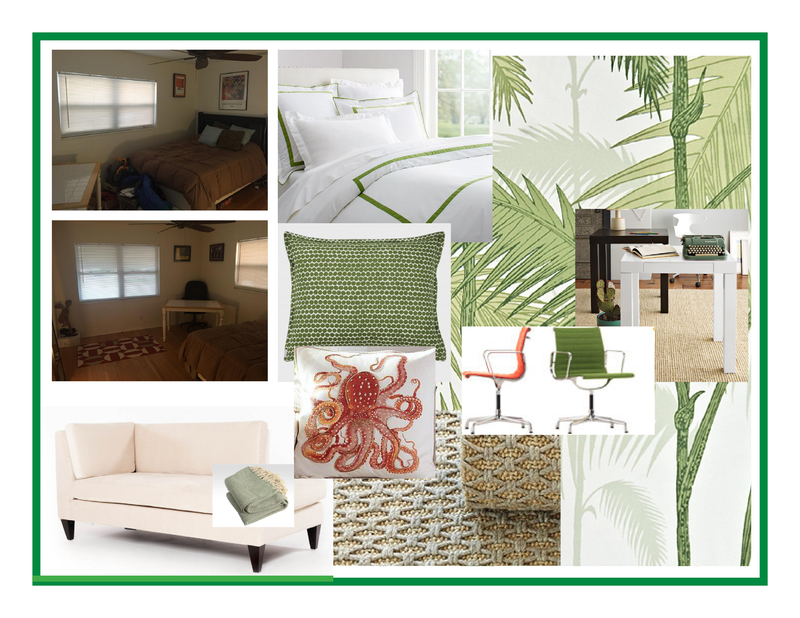 Their Bead Pillow in green would be the perfect accent on either the bed or a chaise under the window. I love orange and green together and the octopus seems ugly enough to be masculine and a great compliment to the bead, so I throw it in there. On the chaise you can see another longtime obsession of mine, the Brahms Mount throw. I’d cover the floor in this great Lattice Knot Wool and Jute Rug from Ballard Designs. The Eames Task Chair by Herman Miller and West Elm Parsons Mini-desk will ensure he visits the room now and again even if it is just to stare at the computer. 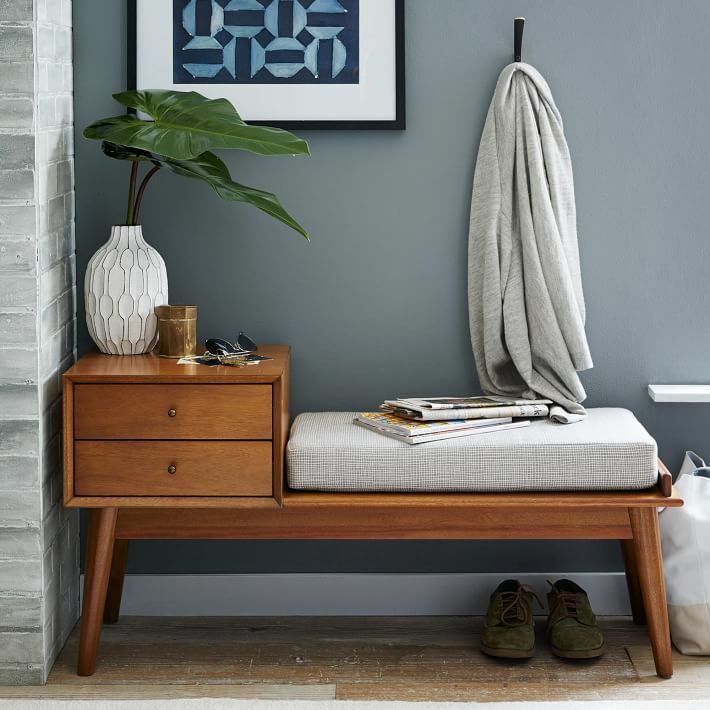 Alternately I love this mid-century West Elm bench. Which could be really beautiful under the window. Stay tuned for additional rooms to follow. I promise no paint, just cleverness in the face of conformity. Rent without reluctance.